The Avbob Cashback Funeral Plan is the company's entry level and most popular product. There are a couple of benefits within this plan. The first and possibly most important is that you can freely choose the level of cover that your other extended family can be insured for. This is different from a couple of other companies that fix cover for your extended family. Your beneficiaries will receive double the cover payout if your die accidentally. You can cover as many of your children as you want but only pay premiums for 1 child. However, with extended family members, there is a limit of six people that you can insure in your policy, and each is paid for. Cover for your own parents is also available, however, cover for your in-laws is only available to you if you have covered your spouse under the same policy as well. Of course as the name of the product indicates, you can get a cash back bonus from Avbob if you do not make claims. Under your policy, if a period of 5 years passes, your entire 5th year' premiums will be paid back to you in cash. A free basic funeral - yes, it's basic but sometimes that's OK. They will also transport the coffin to the funeral in South Africa. However, you need to have had an active policy for over 2 years to qualify for either of these 2 free benefits. 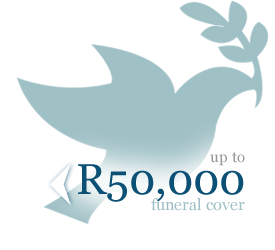 Avbob offers a specific family funeral policy where cover can be as much as R50-000. There are a couple of conditions to bare in mind with this cover, and many of these are also applicable to the Avbob Cashback Funeral Cover. Only the policyholder may have double the benefit in the event of an accidental death. Premiums are revised on an annual basis. The funeral cover is structured as an investment which you can withdraw from after every 5 years. Avbob is a big company, with partnerships within the funeral insurance industry. You can get Avbob to arrange the funeral logistics as part of your policy, but only if you use the Avbob Funeral Service. This service has strong links to funeral parlours and other such requirements you will need at the time of burial. As South Africa's biggest mutual assurance society, AVBOB is well-positioned to cater to the needs of everyday South Africans with funeral policies, life cover policies, and much, much more. That company that started in 1918 has had a long time to develop and refine its products to the appeal of South Africans. You'd be silly to go on comparing funeral policies without listing an AVBOB funeral policy as one candidate to consider. Here's why. AVBOB's funeral policies are easily distributed online, or through its network of over 150 professional funeral brokers. It's easy to see why almost 4 million people have a policy with AVBOB. Your policy with AVBOB determines the amount of coverage you require. 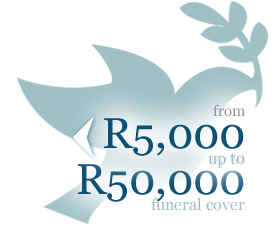 Adequate funeral insurance will cover you over and above the costs of the actual burial. In other words, if your funeral costs around R40-000, there should be at least R10-000 left in your cover for sundry expenses. This amount is the money that your family can use while they adjust to their loss as you now have passed. Similarly, if one of the people you have covered under your policy dies, then the lump-sum paid out to you should be able to cover the actual burial and other expenses. Note however, that this advice is something that you will need to discuss with your AVBOB representative after you have at least received a online funeral cover quote. This estimate of your premium will guide you as to how much cover you need and/or qualify for. Typically, insurance companies leave it up to the family to organize its own funeral. Of course no where is it mandated that the insurer do anything more than just to pay the lump-sum of the insured. However, AVBOB's approach is different. They want to be there every step of the way so that your burial, or that of anyone else you have covered can be conducted in a dignified manner. Death is a painful experience, and many of us can never really get used to it. As part of your AVBOB funeral policy, a representative is made available to you for assistance. The agent can help you with the financial aspects of choosing a cremation or graveside burial. He or she can arrange for a minister or organist for the funeral. Also, because of AVBOB's extensive network of professionals, the company has built relationships with many funeral service providers. These include funeral parlours, florists, transport services, and much more, all of which can be made available for you at preferential rates. Your life and the lives of your loved ones should be honoured with a dignified burial. That is why Avbob funeral cover could be the perfect funeral insurance for you. Avbob's promise is to be here for you and your family all the way through death and beyond, and as such have created funeral policies that will cater to all your expenses at your time of need.